With the increased focus on children’s language in Early Years education, poetry can be a valuable tool in enhancing speaking, listening and communication. 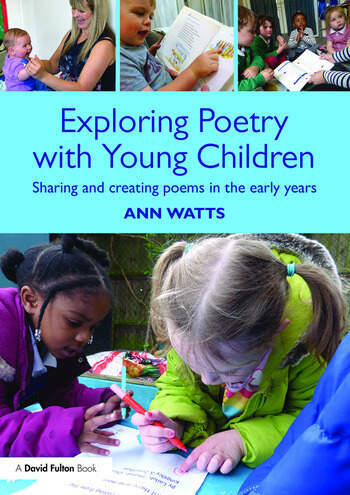 This book provides parents and practitioners with a guide on how and where to start with using poetry with children. Combined with practical suggestions on finding and using poems with children of differing ages and language ability, it also offers advice on how to encourage children to create and develop their own poems. Exploring Poetry with Young Children includes an anthology of a wide range of poems to use with children based on their everyday experiences, ensuring that adults can enhance the learning experience as it happens and enrich the language development of the children in their care. the importance of establishing a poetic awareness in young children. This will be an essential guide for all Early Years practitioners, students and parents who are interested in using poetry to develop the speaking, listening and communication skills of young children. Ann Watts has worked as a nursery school head teacher, an Early Years adviser for Surrey County Council and then as an independent consultant. The main focus of this work has been leading training for Early Years staff as they develop their outdoor areas and consider how best to meet requirements of EYFS. She has also written a range of poetry for both adults and young children.